You’re in a roomful of computer scientists. Most of them are women. All of them are there to promote women in computing. What don’t you talk about? These are the questions I’ve been asking about the recent Ohio Celebration of Women in Computing (OCWiC). In the words of the call for participation, “OCWiC is an opportunity for young women to explore careers in IT, to network with other young women and to meet possible mentors. OCWiC hopes to encourage women to complete their studies in computing by exploring careers and meeting women leaders from business, industry and academia.” OCWiC was sort of a miniature Grace Hopper Celebration. I attended this year’s OCWiC, and I’d been to events like it before. I’d even organized some (smaller) “women in computing” events myself. But recently I’ve been wondering: Are these events improving the status of women in computing? Or are they just teaching women to live with the system that makes it harder for women than for men to be in computing? At OCWiC we spent most of our time networking (with food!) and listening to research presentations. Here’s a breakdown of the schedule. During sessions where the conference was split into multiple rooms, I divided the time by the number of rooms. To sum up — I heard a range of experiences, good and bad. I heard a lot of factors that played into those experiences, and not just gender — parenthood, class, race, age, culture, personality. I heard an impressive array of coping strategies and survival tactics for adapting to the system that makes it harder for some people than others to be in computing. Coping strategies and survival tactics can be useful. But if that’s all we talk about, then we’re accepting the system. We’re reinforcing the system. What about changing the system? Changing the system is a part of feminism. Feminism is often not a part of “women in computing” events. I don’t just mean people who dislike the word “feminism”. (The only mention of “feminism” I found in the annals of the Grace Hopper Celebration was a panel titled “The ‘F word’: The Uneasy Relationship Between Feminism and Technology”.) I mean the taboo on stating that the system is deeply unfair, and wanting to make it fair. Career options outside the academic and corporate world. OCWiC heavily emphasized research careers, neglecting the other 99% of the computing industry. It focused on academia and large companies. I guess that’s not surprising given the sponsors (large corporations, colleges/universities, and ACM-W) and the organizers (professors). I was the only speaker from a small company. None of the speakers talked about starting their own business. None of the speakers talked about contributing to open-source software. This relates back to the issue of changing the system, because you can’t change it if you only know a tiny part of it. Support for people other than college/university students. When I first heard the name “Ohio Celebration of Women in Computing”, I thought the event would have sessions for, well, women in computing — women who may be developers, or sys admins, or tech support, or managers, or hobbyists, or whatever. But no, it was totally focused on students. This also relates back to the issue of changing the system. I don’t just mean the subtle (and I’m sure unintended) message that only certain women in computing are worth celebrating. I mean that, with a mostly new batch of faces at each OCWiC, inexperienced and ready to soak up the same advice as the last batch, there’s little institutional memory and little incentive to change. Protection from discrimination. OCWiC had no anti-discrimination or anti-harassment policy (even though I was assured a few months ago that they would edit: after rereading those emails, I realize that I was told it was being considered, but not assured it would happen). Instead, there was this short and perplexing statement during opening announcements (paraphrased): “Please be respectful of everyone here. If someone says something you disagree with, walk away.” I’m still trying to find out the whole story. But I’m bewildered how it can be controversial for a “women in computing” event to follow the example set by of over 100 conferences that have anti-harassment policies and guarantee some basic rights for its attendees. The gender binary. The call for participation said, “Attendees will be women majoring in computing fields from universities and colleges all over Ohio as well as women teaching and working in computing careers.” I had to ask to find out if genderqueer people were welcome (or allowed). I do know that at least one speaker was genderqueer — me. But I don’t know if anyone realized it, because (like many places) OCWiC wasn’t a place where I felt (or had any reason to feel) comfortable talking about it. 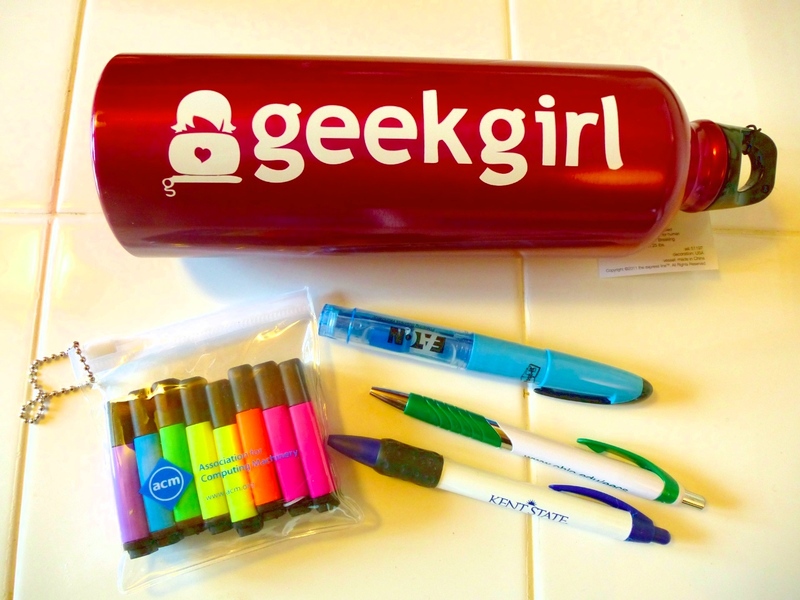 The experience of being genderqueer at a conference designed for cis women was, in some ways, like being female at an event designed for men — hearing speakers address the audience in gendered terms that don’t include you; getting swag that’s fashioned for a gender other than yours (like a “Geek Girl” water bottle from Microsoft Research, which is problematic in its own way, and a ladies’ sweatshirt); constantly interacting with people who don’t share your understanding of gender issues. Where do genderqueer people fit into “women in computing” events? Men as allies. I also had to ask to find out if men were welcome. They were, and three men attended. Nobody talked about enlisting the support of more men. Nobody talked about forming alliances between “women in computing” groups and other organizations for marginalized people in computing (which include men), such as NOGLSTP or the National Society of Black Engineers. Out of all the coping strategies and survival tactics that were suggested, none involved any collaboration with the men in computing. The digital divide. We didn’t talk about the women who weren’t there — the ones who lack the money that is a prerequisite for a career in computing. (Well, I guess one speaker did when she suggested hiring someone to do your cooking and cleaning.) We didn’t talk about the class divide of the women who were there — at one end of the spectrum, the ones who’ve been given an elite, research-focused education (and whom OCWiC was designed for); at the other end, the ones who are working to pay their own way, a few courses at a time, through a career-focused education. Activism. We talked a lot about coping with the system, adapting to the system. We didn’t talk about fixing it. We didn’t talk about the many, many groups who are taking steps to fix it — groups like Geek Feminism, Empowermentors Collective, and the Backup Ribbon Project. One element of activism that was notably absent was the idea of collective action. … My ‘dream’ action for the women’s liberation movement: a smile boycott, at which declaration all women would instantly abandon their ‘pleasing’ smiles, henceforth smiling only when something pleased them. So that “my dream action for the women’s movement is a smile boycott” quote by Shulamith Firestone is doing the rounds… I wanted to comment on a particular response I’m seeing repeatedly. And I really wonder what’s going on here, in that these responses seem kinda unrelated to the quote. It can be very powerful to find one’s scope of individual action on this kind of thing. But that’s not what the quote is about. Firestone is suggesting an action for the women’s movement. She’s suggesting a smile strike. That is, an organised, concerted effort, taken by a great number of women acting in solidarity with each other. But it seems like the only way many people are able to hear quotes like that is, “this is something more individual women should do”. “This is something more individual women should do.” Now that sounds familiar. A woman asks how to cope with working in a male-dominated field. The answer: some variation on “be assertive” or “achieve work-life balance” or “build your network” or “overcome impostor syndrome”. These are things more individual women should do. Is this making it any easier for women to be in computing? Or, twenty or thirty years from now, will women still have to go to OCWiC to learn how to cope? Will the attendees be asking the same old questions, and will the speakers be giving the same old answers? How can break out of the loop? How can we change the system? How can we collaborate to accomplish more than each of us could accomplish alone? People are already collaborating and changing the system — a whole movement of people — the loosely connected networks of people who are advocating for diversity, equality, and inclusivity in computing via blogs and social media. They back each other up when sexism, racism, and all those other “-isms” happen. They share solutions they tried that worked. They blow off a lot of steam, but not unproductively — they’ve amassed a public record to disprove anyone who says that discrimination no longer exists. For example, after painstakingly documenting incidents of harassment at tech conferences, they successfully agitated for anti-harassment policies. They’re creating tangible change. I wanted to bring some of that collaboration and change to OCWiC. Here’s where the story gets awkward. It’s easy for me to point fingers at (I guess?) everyone else at OCWiC and say, “You didn’t talk about this and this and this.” But now it’s time to own what I myself did and didn’t contribute. The first I heard about OCWiC 2013 was when one of my former co-workers invited me to speak on the industry careers panel. I had been to the Grace Hopper Celebration and similar events before, so I knew vaguely what was and wasn’t going to be talked about. I thought maybe I could give OCWiC a little push from what I feared it would be — teaching marginalized individuals that they have to blend in, they have to work harder — toward what I dreamed it could be — collaborating to change the system. Have you ever felt excluded from the dominant culture of computing? Are you concerned about how the lack of diversity will affect the future of computing? This BOF will be a guided discussion about making computing more diverse and inclusive. Gender, race, ethnicity, class, age, religion, sexual orientation, physical ability, mental health, and parenthood are all on topic. You’re welcome to stay for the whole session or just drop in for a while. Thirty people (out of OCWiC’s 170 attendees) came to Power to the Marginalized People. In the hour and a quarter they were allotted, they shared a continuous stream of stories and insights — and many of them stayed late, because there was even more they wanted and needed to talk about. Remember that list of things I heard about the system? About half of them came from this session. Was it enough? The night after the session, I laid awake for hours, reflecting on Power to the Marginalized People and empowering marginalized people. I compared my outline for the session to what we actually discussed. I thought about what I, and we, could have done better to create a safe space for everyone in the discussion, to hear the voices of the people who didn’t (feel safe to?) speak. I regretted that, although we’d talked a lot about being marginalized ourselves, we’d talked very little about the flip side: the ways that we (those of us who are white, or straight, or wealthy, or whatever) marginalize others — and how to be good allies. I regretted that, although we’d talked about (yet more) coping strategies and survival tactics, we hadn’t imagined a future where coping isn’t necessary. What I learned from this session, I’ll be applying to the next event I’m leading — the Diversity in Open Source workshop at Ohio LinuxFest in September. It’s a half-day guided discussion for people who want to change the system that makes it harder for some people than others to use or contribute to open source. Want to come? Have you ever led a discussion on diversity, equality, and inclusivity? What did you learn? Are you planning to lead such an event? Feel free to plug your event in the comments. As someone who used to fit right into the target audience of OCWiC (student, researcher, female), and who has benefited from events similar to OCWiC, I think OCWiC was helpful to many. The students had a chance to meet students and faculty from other schools. They got practice listening to and giving research presentations. They saw proof that women can succeed in computing. And those coping strategies and survival tactics? Many women do find them helpful. Many women today would not be able to succeed in their careers without them. As someone who didn’t quite belong at OCWiC (software developer, genderqueer, third-wave feminist), I can say that — as an event aimed at people who don’t quite belong in computing — OCWiC fell short in many ways. It focused on an extremely limited sector of “women in computing”. It failed to provide an anti-discrimination policy. It slated more time for a dance party than for discussion about diversity and inclusivity. Most of all, OCWiC didn’t try to change the system that makes it harder for women than men to be in computing. It didn’t act to create a future where OCWiC isn’t needed anymore. What do you think OCWiC, the Grace Hopper Celebration of Women in Computing, and other “women in computing” events accomplish or don’t accomplish? What events are changing the system? What events are un-marginalizing marginalized people in computing? I just wanted to thank you for posting about these issues that occur at conferences like OCWiC. I attended the Grace Hopper Celebration in October 2012, and while there, I was disappointed to hear an abundance of the coping tactics for individuals that you mentioned (especially things like “you just need to be more assertive, confident, etc.”). Encouragement and strategies for collective action seemed to be largely absent from most of the discussions and panels that I attended at GHC. I sensed that part of this was because the conference organizers wanted to stay away from getting “too political” – almost nobody dared to mention the dreaded f-word, or anything to do with progressive politics, etc. I think GHC was good for general information about career development – how to prepare your resume; what you need to know when applying to graduate school, and so on – but as a college student and a cis-gender woman of color with a physical disability, I very much felt that the conference was (intentionally or not) operating on the assumption that most of the attendees were white, cis-gender, middle-class, non-disabled, college students. From what I can remember, the conference did have a few (first-time?) particular events that were labeled as targeted towards LGBT students or students of color, but the couple of events for people of color that I attended were lackluster. While I appreciate the spirit of inclusiveness behind these events, I’m not sure that they were particularly effective at welcoming marginalized attendees (especially non-students). @puzzlehunter, thanks for talking about your experiences with the Grace Hopper Celebration. Your description of the event’s strengths and weaknesses is similar to what I remember from 2006 and 2008. I sensed that part of this was because the conference organizers wanted to stay away from getting “too political” – almost nobody dared to mention the dreaded f-word, or anything to do with progressive politics, etc. That’s a good way of putting it. The dreaded f-word and the dreaded p-word. I wonder why the avoidance of being “too political” (that is, expressing politics different from whatever is considered normal)? I wonder to what extent (if any) it’s intentional? I watched a talk in the last couple of months about privilege. He mentioned that one of the trade-offs of privilege is that the privileged do not learn how to cope, from what I understood. I learned that learning coping mechanisms is not necessarily a bad thing. I have privilege in some aspects of my life, and because of it I do not know how to handle some situations as smoothly as someone who learned how to cope with those situations. An example of this is the American sensational reaction to violence on U.S.-soil as opposed to the reaction to violence where may occur more frequently. I see some Americans have not learned how to cope with violence and that has led to panic-induced legislation and reactions along ethnic and religious lines. I think that is important for everyone to learn how people cope, but more importantly learn why someone was required to cope. Sorry, I failed in my search for the video because I couldn’t remember the speaker’s name or search terms that were unique enough to provide the result. He’s fairly well-known about speaking about race and privilege and identifying his own privilege. Was it Tim Wise speaking about beached white males? In my original post, I was thinking of “coping” as when you see unfairness blocking your path and you choose to detour around it rather than trying to kick it out of the way. It’s helpful to learn both routes. It’s nice, when you have the capacity, to help clear the path for the next people. Many people have developed creative and courageous mechanisms for coping (in all senses of the word). It’s impressive. I wish you could get credit for it on a resume. Just because you’re underprivileged and have extra practice with unpleasant situations doesn’t necessarily make you a coping superhero. There’s this cultural narrative (e.g. every sports movie ever) that the underdog thrives in adversity. But there are many times when the underdog just doesn’t do as well as if there weren’t adversity. The funny thing is that I know a little better how to handle some occasional situations (tip from Marie Klawe: what’s the first thing to do if someone comes into your office and starts crying? hand them a tissue). Yet I struggle with day-to-day situations that, for others, require no coping at all.